For residential and commercial exteriors Suflex specializes in Senergy® EIFS and stucco, a well-known brand throughout the USA, Canada and beyond. The Senergy® brand is associated with high-quality wall systems, architectural products and finishes in unlimited colours and designs that add property value, curb appeal and energy savings to your home or business. 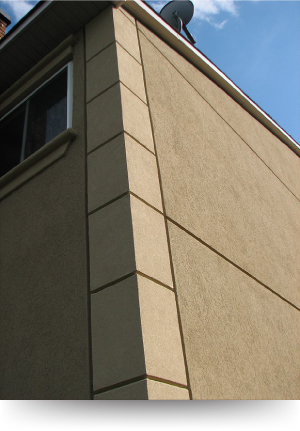 Stucco and finishing systems installed by Suflex resist the winter freeze and thaw cycles and extreme summer heat and humidity you find throughout Ontario. Protect the investment you have in your commercial building. Contact us in Ottawa for a free estimate and consultation about Dryvit® finishes, continuous insulation and Outsulation® Systems for cladding superior to all others.